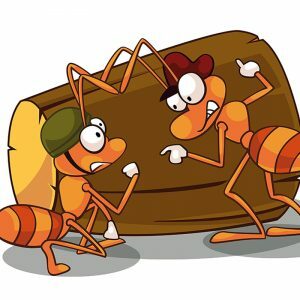 At this time of year, ant pest control can be a challenge and you may need to declare all-out war on ants. Your battle plan will include some things that you should do to repair and clean up your house and yard. So, getting rid of ants just might win the “Best Looking House on the Block” award for you as well. Ants may establish nests inside or outside of your home. So the first step is to search for ants inside and outside of your home. Inside, look for ants along the carpet edges, doors, windows, and in all areas of the kitchen. Outside, look around foundation walls, in mulch and vegetation close to the house, and under any item that is on the ground like fire wood. To prevent future infestations, fortify your home by sealing cracks and crevices in your outer walls, windows, and doors with caulk or silicone. Spray these entry points and the ant trails themselves with a detergent. This removes the pheromone that ants lay down for other ants to follow. Remove dried leaves in the yard and close to the house. Keep shrubs and mulch from touching the house. If you are losing the war against ants, give Bug Authority a call for ant pest control. We have the experience, dedication, and technical know-how to defeat any ant invasion. We are a licensed pest control company with over 50 years of experience.